A central gas facility located in the Prudhoe Bay field on Alaska's North Slope, which was proposed as a starting point for an Alaska Gas pipeline to the Lower 48 states. Sarah Palin promises to focus on energy independence if she becomes vice president, a mission she claims to be uniquely qualified for as governor of an oil and gas-producing state. "We must get there," the GOP nominee said September 18 on Fox News. "It is a matter of national security and our future prosperity." But earlier this year, Palin missed an opportunity to help the US mainland obtain billions of cubic feet of natural gas from Alaska's Cook Inlet. Her support of an effort by major energy producers to export the fuel to more lucrative markets in Asia came just as a facility that will provide the first practical way to bring the state's natural gas to the lower 48 states was set to open on the Baja coast in Mexico. Cook Inlet's natural gas has been exported for years, and until this past spring, it pretty much had no alternative. Without a pipeline or even facility to receive natural gas on the West Coast, it had no way of reaching the lower 48 states. As a result, producers sent whatever wasn't used locally  28% of total output last year  to a Liquified Natural Gas (LNG) plant on the Kenai Peninsula, where gas was chilled to a liquid state and put on tankers for Japan and other Pacific rim countries. But since this past May, some of Alaska's gas could have wound up in domestic hands. San Diego-based Sempra Energy opened the first LNG terminal on the West Coast of North America. The Mexican facility, a $975 million project, is tied directly to the gas pipeline system that leads to California, Texas and Arizona. The Alaskan LNG plant is owned by Marathon Oil and ConocoPhillips, which asked the Department of Energy in 2007 for permission to export about 100 billion cubic feet of gas to Asia over two years from the roughly 300 billion cubic feet of gas that is likely to be produced. The overseas connection not only provides an outlet for fuel produced beyond the limited needs of Alaska, it is highly profitable  LNG prices in the Pacific rim can run twice as high as those in the US. Palin personally intervened in April, 2007, but her concerns were strictly local. She asked DOE to condition its approval on guarantees that gas needed in Alaska not be diverted to the better-paying foreign venues  a position she held until this past January, when the producers reached separate agreement with the state to meet its needs. At no time did Palin or her government cite the desire to preserve Alaskan gas for the lower 48 states. The Sempra terminal began operations just four months after Palin announced unconditional support for the Marathon and ConocoPhillips request and a month before DOE approved their plans to export gas to Asia. 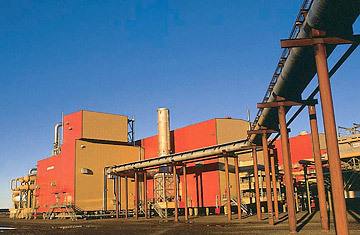 The development of the Mexico plant was well-known and much anticipated in energy circles. According to Senator Ron Wyden, the Alaskan gas slated for Asia between 2009 and 2011 could meet the annual consumption of 1.4 million American families. The Oregon Democrat has accused Palin of a "major contradiction" between her support for gas exports and campaign emphasis on more drilling to slake US energy needs. "It's pretty outrageous to scare Americans about energy shortages while she has been approving export of billions of cubic feet of natural gas that could be providing energy to homes in Alaska and the lower 48 states," he said. ?Palin's natural resource commissioner, Tom Irwin, said the governor didn't push the Sempra option with DOE because "it never came up in discussions that there was a competing market or a competing desire." But she didn't raise the idea, either, he said. The volumes of gas were so small, it didn't seem worthy of consideration. He said Palin has focused on a bigger payoff: construction of a 1700 mile pipeline to the lower 48 that could catalyze gas production on Alaska's North Slope. The pipeline is far from a sure thing, however, and the first cubic foot of North Slope gas years from production. Nevertheless, Irwin said, whatever quick help could have been provided from gas now headed for foreign markets pales by comparison. "We put our energies into the big impact," said Palin's commissioner.